Many of us are familiar with electrolytic splitting of water from their school days: if you hold two electrodes into an aqueous electrolyte and apply a sufficient voltage, gas bubbles of hydrogen and oxygen are formed. If this voltage is generated by sunlight in a solar cell, then you could store solar energy by generating hydrogen gas.This is because hydrogen is a versatile medium of storing and using "chemical energy". Research teams all over the world are therefore working hard to develop compact, robust, and cost-effective systems that can accomplish this challenge. But it is not that simple, because an efficient hydrogen generation preferably proceeds in an acidic electrolyte corroding very fast solar cells. Electrodes that so far have been used are made of very expensive elements such as platinum or platinum-iridium alloys. Under the "Light2Hydrogen" BMBF Cluster project and an on-going "Solar H2" DFG Priority programme, a team from the HZB Institute for Solar Fuels has now developed a novel photoelectrode that solves these problems: it consists of chalcopyrite (a material used in device grade thin film solar cells) that has been coated with a thin, transparent, conductive oxide film of titanium dioxide (TiO2). The special characteristics are: the TiO2 film is polycrystalline and contains a small amount of platinum in the form of nanoparticles. This new composite presents some special talents. Firstly, it produces under sun light illumination a photovoltage of almost 0.5 volts and very high photocurrent densities of up to 38 mA/cm2; secondly, it acts as a catalyst to accelerate the formation of hydrogen, and finally, it is chemically protected against corrosion as well. Since TiO2 is transparent, almost all sun light reaches the photoactive chalcopyrite, leading to the observed high photocurrent density and photovoltage comparable with those of a conventional device-grade thin-film solar cell. The recipe for this novel and elegant coating was developed by Anahita Azarpira in the course of her doctoral studies in a team headed by Assoc. Prof. Thomas Schedel-Niedrig. She uses a chemical vapour coating technique (sprayed ion-layer gas reaction/Spray-ILGAR) that was developed and patented at the HZB Institute for Heterogeneous Material Systems (EE-IH). In this process, the titanium dioxide and platinum precursors are dissolved in ethanol and converted to a fog using an ultrasonic bath. The produced aerosol is directed over the heated substrate using a stream of nitrogen gas resulting into a polycrystalline thin film grown on the chalcopyrite substrate over time with embedded nanoparticles of platinum. 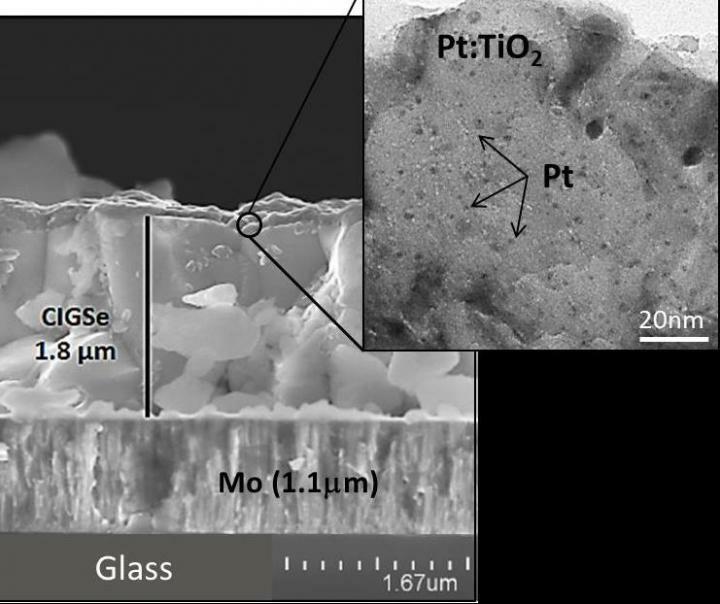 Azarpira and her colleagues varied the amount of platinum in the precursor solution in order to optimize the properties of the novel composite photoelectrode device.The properties were optimal with a volumetric proportion of about 5 % platinum (H2PtCl6) in the precursor solution." More than 80 % of the incident visible sunlight was photoelectrically converted by this composite system into electric current available for the hydrogen generation", says Schedel-Niedrig. That means little light is lost and the quantum efficiency is virtually very high. In addition, it has been reported in the very recently published article that the composite shows high long-term stability over 25 hours and reveals large photoelectrocatalytic activity of about 690 hydrogen molecules produced per second and per active center at the surface under illumination. However, there is still a lot to do. Currently, the majority of the required voltage between the composite photocathode and a platinum counter electrode of around 1.8 volts is still coming from a battery. Hence the solar-to-hydrogen efficiency has to be clearly improved. "But anyway, we demonstrate the feasibility of such future-oriented chemical robust photoelectrocatalytic systems that have the potential to convert solar energy to hydrogen, i.e to chemical energy for storage. As a consequence we have successfully developed and tested a demonstrator device for solar hydrogen production with a company in Schwerin under the Light2Hydrogen project, according to Schedel-Niedrig.